1. Introduction: the puzzle of participatory institution building; 2. Theoretical framework: participatory institution building through sweeping sectoral reform and policy entrepreneurs; 3. The origins of participatory reforms in Brazil and Colombia; 4. Brazil's health councils: successful institution building through sweeping reform; 5. Brazil's social assistance councils: the advances of a broad but divided coalition mobilized through sweeping reform; 6. Colombia's planning councils: the limits to participatory institution building without sweeping sectoral reform; 7. Colombia's health committees: failed participatory institution building in the absence of policy entrepreneurs; 8. Lessons for institutional change, interest representation, and accountability. Lindsay Mayka is Assistant Professor of Government at Colby College, Maine. Previously, she was a Democracy Fellow at the Ash Center for Democratic Governance and Innovation at the Harvard Kennedy School and a Visiting Scholar at the University of California, Berkeley's School of Social Welfare. 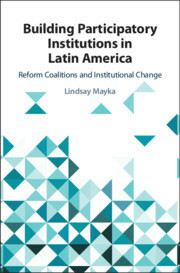 Mayka's research has appeared in the Journal of Democracy, Latin American Politics and Society, and the Journal of Comparative Politics.